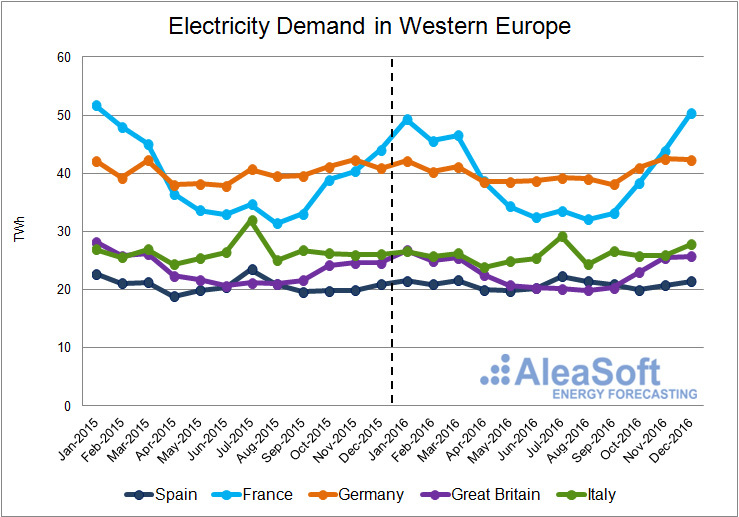 5th January 2017 – The electricity demand of some of the main countries in Western Europe has had an unequal behavior in 2016. 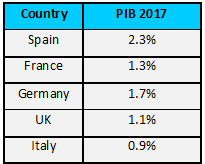 In Spain and France, the gross electricity demand has increased compared to 2015, while in Germany, Britain and Italy the behavior has been the reverse. 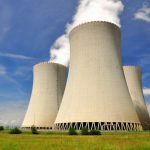 In Spain, electricity demand in 2016 was 0.7% higher than in 2015, according to data published by REE (Red Eléctrica de España). However, once the effects of seasonal and working patterns have been corrected, there has been zero growth. September was the month of greatest year-on-year gross growth (6.7%), a month in which temperatures were higher than in the same period of 2015. It is estimated that the Spanish economy grew by 3.2% in 2016. Electricity demand in France has grown by 1.4% in 2016 over its predecessor. The biggest growth was in the last quarter of the year (7.4%), where temperatures were significantly lower than the same quarter of the previous year. The annual growth of the French economy is expected to be 1.2% in 2016. In Germany, the electricity demand in 2016 was 0.3% lower than the previous year. The average temperature of Germany in the first three quarters of the year has been slightly higher than that of 2015. While in the last quarter of the year temperatures have been lower, the electrical demand of this quarter has been 1.3% higher than in the same quarter of the year 2015. Taking into account that the values of growth of GDP are still not available for the last quarter of 2016, the annual value is expected to be around 1.7%. In Britain, 2016 has closed with a decrease in electrical demand of 2.6%. The average temperature of the first three quarters of the year was higher than that of 2015, while in the last quarter the temperature was lower than the same quarter of the previous year. As for UK GDP, it is estimated that in 2016 the economy grew by 1.8%. In 2016 electricity demand in Italy was 1.9% lower than in 2015. The largest decrease in demand, -8.6%, occurred in July 2016, as a result of the heat wave in July 2015 that significantly increased demand for that month. The Italian economy is expected to have grown by 0.8% in 2016. 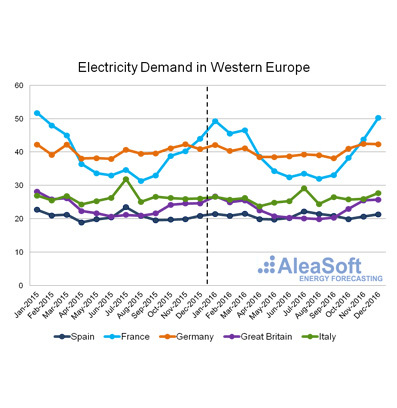 Monthly electricity demand evolution in Western Europe – 2015 2016 – (TWh). Sources: Spain: REE, France: RTE, Great Britain: National Grid, Italy: TERNA. 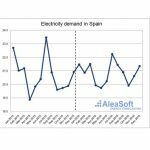 AleaSoft expects that the electricity demand of the main European countries will grow in 2017 compared to 2016. AleaSoft forecasts have been obtained using a mean temperature scenario and the predicted GDP growth figures for each country are shown below.